Quick Hair Clips and party favors! EEEKKKK! And not because Halloween is coming before I know it! I can't believe it has been so so so long since I last updated this blog! Time has gotten away from me and I have to admit I have not created any projects in weeks! 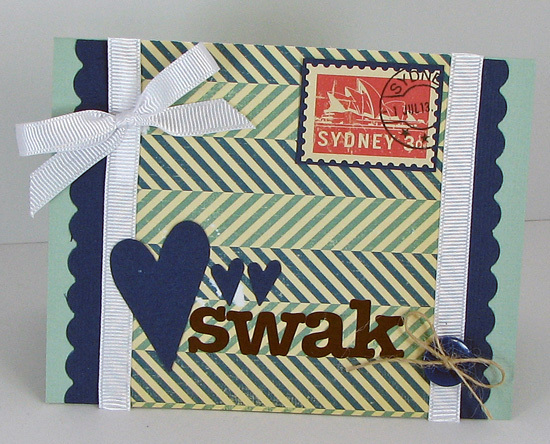 At last things are finally starting to settle down and I created three layouts and two cards this last weekend. It felt good to break out my paper trimmer and punches again- hehe! I will share these projects with you soon, I promise! So today I have some quick (very quick) hairclips I created with some of my leftover supplies. I cleaned out my scraproom and had a box of stuff waiting to be donated. Before dropping it off I thought- can I do anything with this? And so these clips were born. I made clips like this before with flowers and brads, but I am loving how the cute little felties look! I used some plain metal clips I bought at Hobby Lobby. The ribbon is left over scraps of Bo Bunny ribbon and the embellishments American Crafts Flair. To create them trim the ribbon just slightly larger than the top of the metal clip. Apply a thin line of strong liquid adhesive (I used Beacon 3 in 1) to the back of the ribbon. Then adhere the ribbon to the metal clip folding the left over edges down underneath the clip. 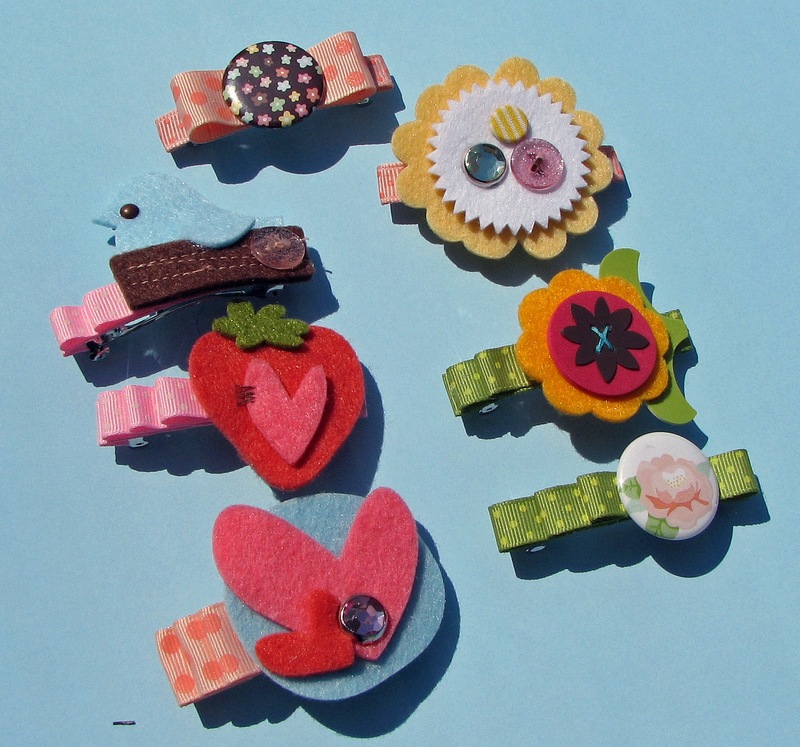 Then you can decorate the clips with more folded ribbon and the flair using the liquid adhesive. 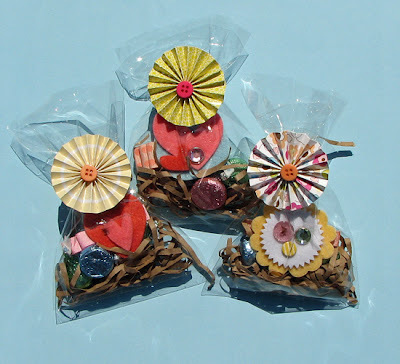 To make cute party favors add a clip to a cellophane bag filled with candy and tie with a twist tie. Glue a paper flower to the front. Hi everyone! I hope you are all having a great start to your September. I couldn't let September go by without some apple picking! The orchard opened this weekend and I was there with two little girls in tow picking lots of apples and of course eating lots of apple doughnuts. I love everything about fall!! I am so excited this time of year! So before I break out my fall papers and photos, I decided to scrapbook some photos of my dear Frances this summer at the lake. She looks so grown up these photos!!! Aaahhhhh!!! I can't believe how fast she is growing! It amazes me, but at the same time makes me a little sad. I feel like everything is passing me by. So I wrote a little note to her on this layout telling her how much she means to me and how much I love her. My assignment for the blog was to create a simple version of this layout and then to step it up with a more embellished version. You can see my simple version on the Bo Bunny blog HERE. The September ScrapRoom Kit is now available! It is full of bright colors and very FUN embellishments. 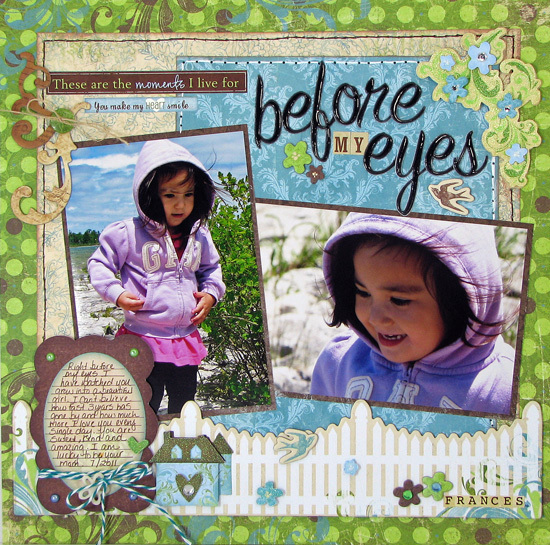 I worked with the Double Shot October Afternoon kit this month. I have to say I don't have many travel pictures, but this kit was fun to work with. 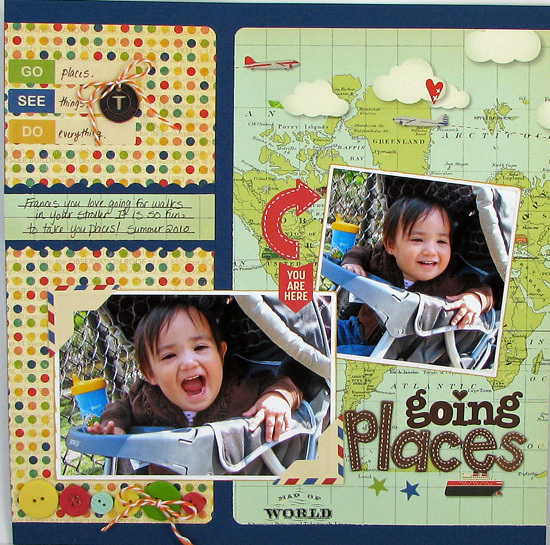 I love using papers and embellishments to tell the story behind my layouts and this map paper did just that! That's me the last couple weeks, a busy little bee! After 10 months of staying home with my two sweet girls on August 15th I had to return to work. It is has been go, go, go ever since! I love being a teacher, but I love being a mommy more and I was heartbroken to leave them at daycare on my first day back. We are all slowly gettting used to our new routine- waking at 5am, getting ready for work, warming bottles, dressing two little girls, and getting our the door hopefully by 6:15am. I try to update the blog a few times a week, but it just wasn't happening these last two weeks! I am hoping now to get back on track. So to start I have a new layout to share using the Pebbles "Every After" line. I mean how could I resist using this princess paper for my little princess? Thanks so much for coming by and bearing with me during these busy times! Have a great Friday!